I had never seen Disney and Pixar’s 2004 film The Incredibles before last week. This is insane because 1) I love Brad Bird’s The Iron Giant and 2) I love Pixar. However, I’m not very interested in superhero or comic book movies in general, so the plot never really grabbed me. But after seeing some of the architecture and interior design of the film online, I decided I wanted to check it out. Note: There may be some spoilers to follow, so if you’re like me and it takes you over a decade to watch a movie, be warned. Bob and Helen’s retro-furnished living room. 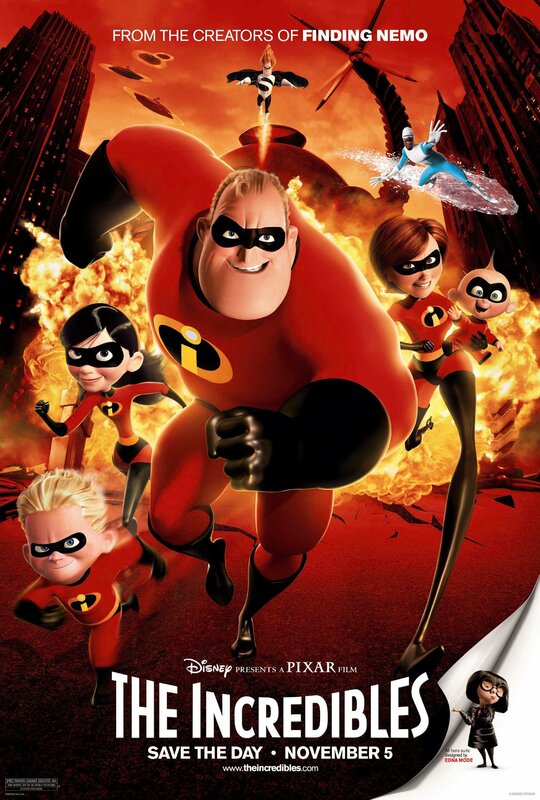 The Incredibles is about Bob and Helen Parr and their children Violet, Dash, and Jack-Jack, who are “Supers” (humans with superpowers) trying to live bland suburban lives and hide their superpowers from a world that disapproves of them. Bob (the former Mr. 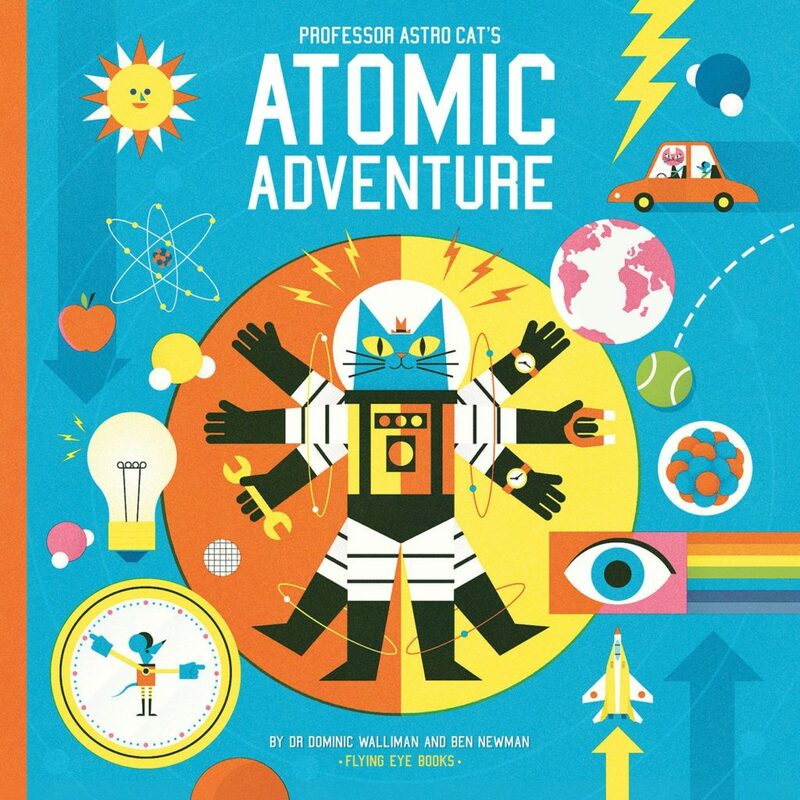 Incredible) is completely dissatisfied with his new life, until he receives a message asking him to take on a secret mission to destroy a malfunctioning robot. Eventually, he discovers this is all the evil plot of the super-villain Syndrome. The film is visually beautiful and retro-tastic. We are treated to Art Deco and Googie architecture, retro furniture, vintage clothing, and cars since it takes place in an era that mixes 1950s and 1960s styles. 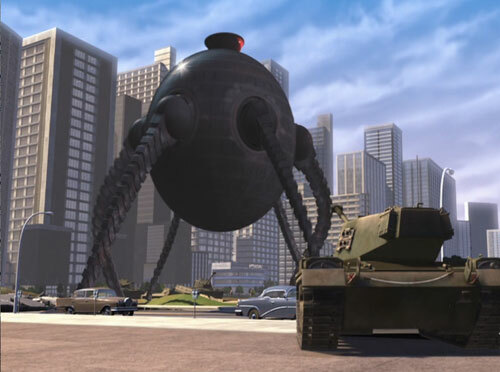 (Learn more about the architecture of The Incredibles) What I was most interested in was the retro-future technology used in the film, especially by Syndrome who employees rocket boots, automated ships, pod-like people movers, and security hover crafts on his island. 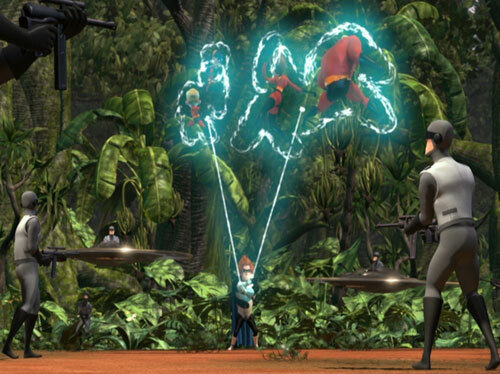 Syndrome captures the Incredibles while his security team floats in their hovercrafts behind him. Syndrome’s Omnidroid attacks Metroville in a vintage scifi movie throwback. Overall, the film was enjoyable and fun, though nowhere near the best Pixar movie . I found myself a little bored during some parts and was disappointed by how much of the technology was slick and modern instead of retrofuturist. 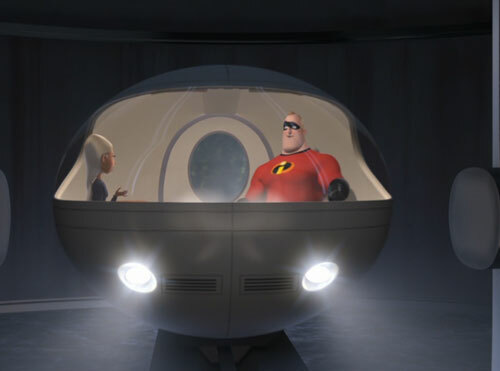 If you enjoy comic book or superhero movies and don’t mind the family-friendly packaging, you’ll enjoy The Incredibles. If you’re only interested in the retro-1950s and 1960s style architecture and technology, you may be slightly disappointed. 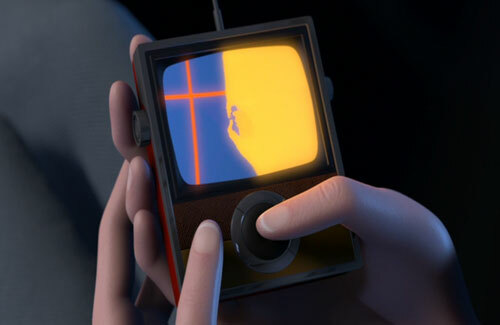 Retro-style technology: Incredibles suit homing device. Though this movie doesn’t quite live up to Brad Bird’s first film The Iron Giant , I am still immensely excited about his upcoming film Tomorrowland.